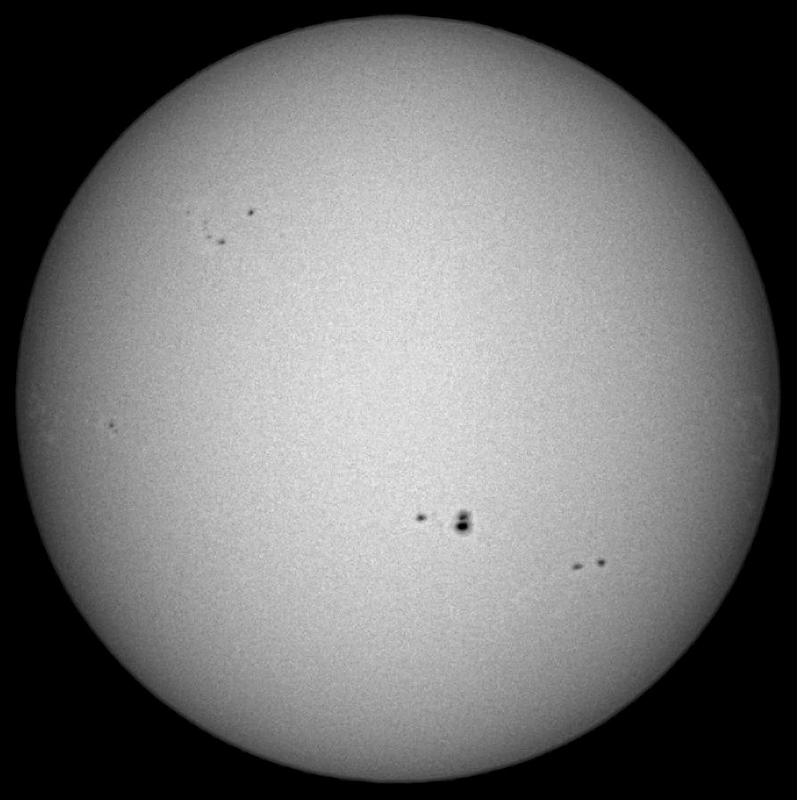 White light images of the Sun on Saturday morning 06th July. 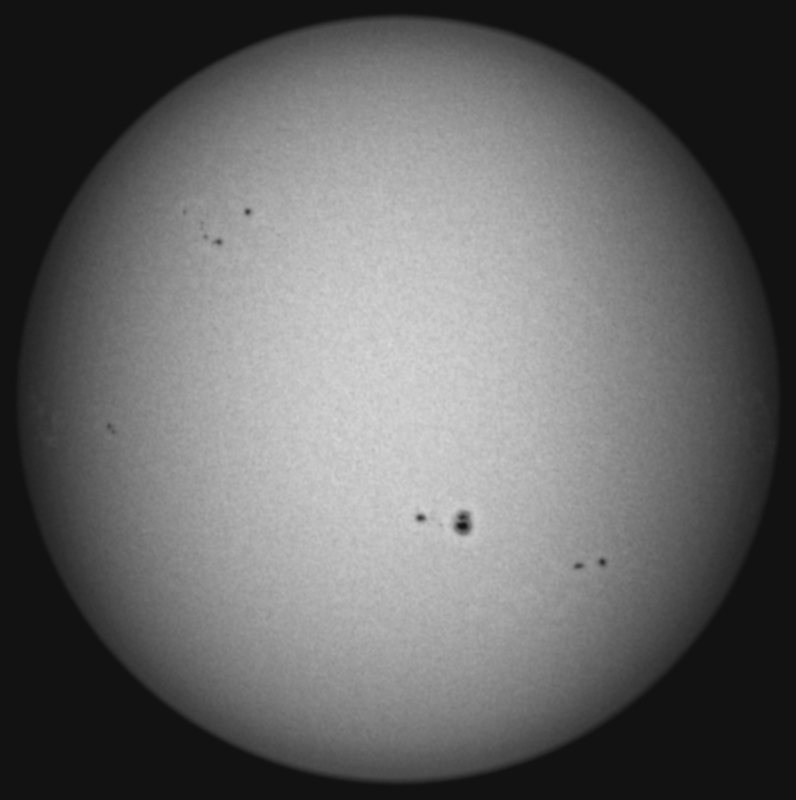 Full disc image, North is up. 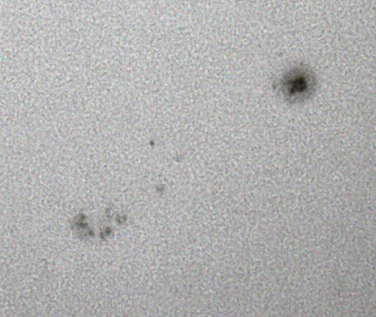 Close up of the main sunspot groups 1785 and 1787 (using a 3x Barlow lens). Both images obtained using a 72mm refractor with a white light Herschel wedge, polarising filter & an Imaging Source As41 camera. A glimpse of the Sun on last Saturday morning, between the breaks in the cloud. 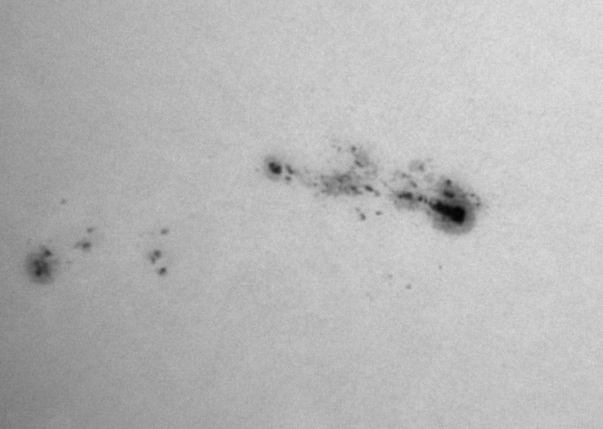 Close up of sunspot 1756, image obtained on Sunday 26th at 10:45. 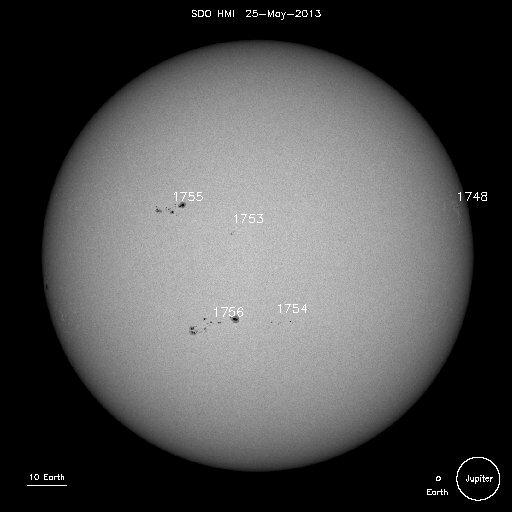 The main sunspot top right is similar in size as the Earth. Looking at the large sunspot, a ‘light bridge’ can be made out on the LHS extending into the much darker central umbra, the width of the light bridge suggests that the sunspot is mature and on the downward phase in its life cycle. 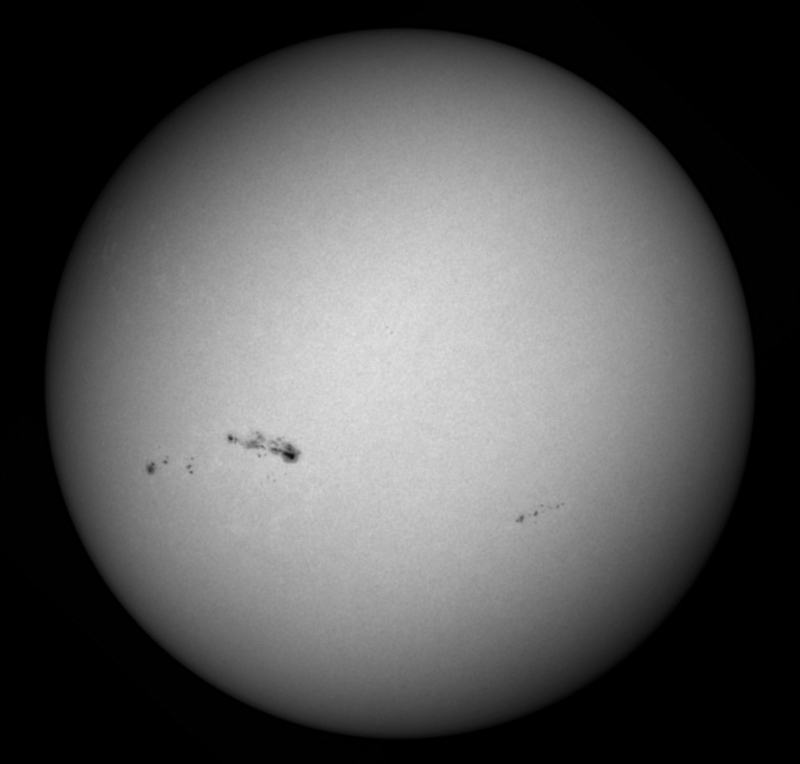 Also, filaments can just be seen in the lighter pre-umbra surrounding the core of the sunspot. The filaments are magnetic in nature and radiate out from centre. On the Sunday night, the skies remained clear and I was able to take the opportunity to do some observing with a new Mallincam astronomy video camera. The shot below is my first attempt using this set up with the 200mm SCT telescope. This is a stack of about 10no single video stills each about 6-10 seconds in exposure length. 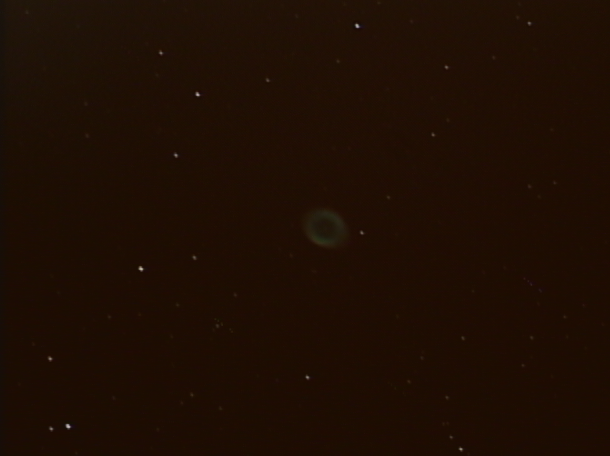 The target is the ring nebula or Messier 57. 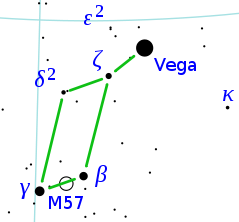 M57 is a planetary nebula in the constellation of Lyra, near the bright star of Vega and is currently visible to the south in a modest telescope. The Ring Nebula is a shell of ionised gas which has been shed from a dying star originally similar in size to the Sun as it went through its red giant stage before turning into a white dwarf, which can just be made out in the centre of the image below. 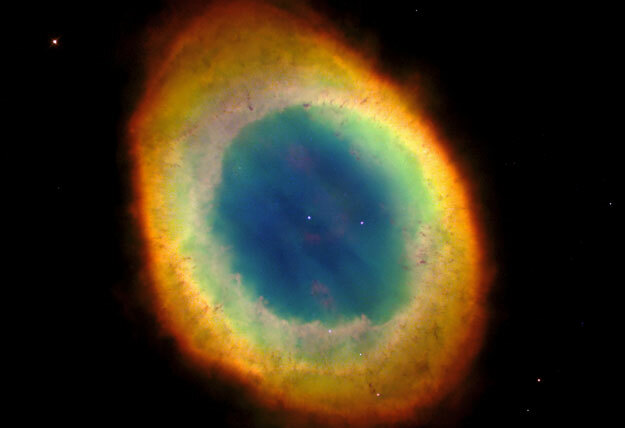 The Ring Nebula is about 1 .3 light-years in diameter and is some 2300 light years away from us. The blue green tinge is due to the presence of doubly ionised oxygen, whilst the outer red tinge is due to the presence of hydrogen. The white dwarf at the centre is actually 200 times more luminous that our Sun and is made of primarily carbon and oxygen.